Laff-N-Grin provides inflatable slides to Bergen County residents guaranteed to make any party or event fun! 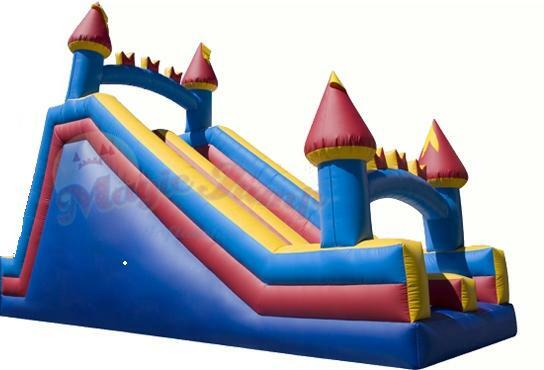 The Giant Castle Inflatable Slide unit measures 27 feet long. Two lanes allow two kids at once to climb up the ladder and slide down an 18 ft slide! The slide platform is 11 feet high and the decorative castle towers top off at 18 ft. The manufacturer recommends riders be 4ft tall for this ride– the ladder is something between a rock-wall and rope-ladder. “When another company cancelled in the last minute, you guys saved my sons birthday party. Thanks so much,you saved the day!” – Lisette M.
View Larger MapBergen County is the most populated county in New Jersey. It is a part of the New York City Metropolitan Area and its county seat is Hackensack. Bergen County is home to facilities such as Metlife Stadium, the Izod Center, and the Steuben House.